Reason for visit: Lunch during a team building day with work colleagues - we were gardening at a children's centre and went for lunch nearby. My companions ate: Most people had burgers but several of them went for the extra hot marinade, which my boss likes so much that I took him a bottle when he moved back to America and I went to visit our office there! We also had one vegetarian in the group who had a beanie burger; there is more than one veggie option which is good. The food was: The chicken is good quality and tasty and the baps are 'proper' bread. I'm not sure I would bother having the halloumi with the chicken burger again though as it's quite salty and doesn't melt. Price range/value for money: It depends if you class this as fast food or not; it's more expensive than a McChicken sandwich but good value as a restaurant. Would I recommend it? 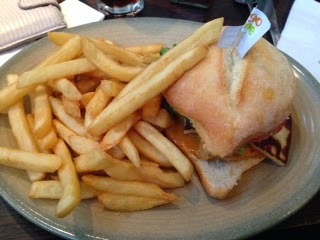 I like Nando's, but not as much as a lot of my friends - I don't really understand why some people rave about it. The menu is relatively limited but if I did want a good chicken burger this is where I would go.